Equipped with a double bed, private bathroom and shower. 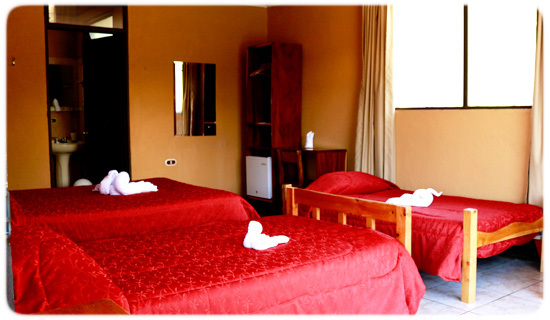 They offer comfort and a quiet space for couples visiting Monteverde area. Rooms are also provided with television, small refrigerator and internet access via Wi-fi. Equipped with a double bed, shared bathroom and shower. They offer comfort and a quiet space for couples who visit the area of Monteverde at a comfortable price and with Wi-fi Internet access. Equipped with a double bed and a single bed. They offer comfort and a quiet space for families or friends who visit Monteverde area at a comfortable price, with Wi-fi Internet access, small refrigerator, cable TV and shower. Equipped with a double bed and two single beds. They offer comfort and a space for families or friends visiting the Monteverde area, with Wi-fi internet access, small refrigerator, cable TV and shower.